Time for some self promotion here.. passEnger (me, one half of JMM crew) has got some new music released! Turin based Eclipsemusic has just published Black Varian, a 12″ that follows my previous release The Funk/The Fall for the label. The original version of “Black Varian” was featured on my digital release out on Radiance Records (Venice based netlabel, now closed) back in 2008. 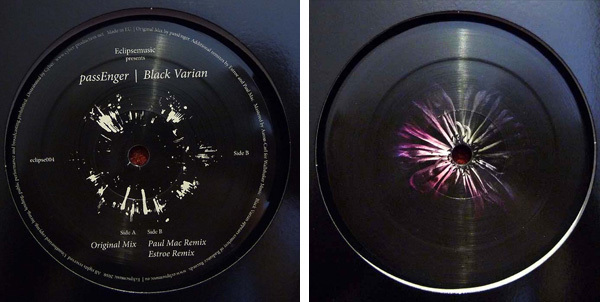 Eclipsemusic’s label manager fell in love with it, and now, improved and remastered by Aaron-Carl (Wallshaker, Detroit), Black Varian has finally landed on vinyl, along 2 remixes courtesy of Paul Mac and Estroe. …good to see how much a track can travel. From its home to Venice, then unavailable after Radiance’s closure, and resurrected to enjoy a trip to Detroit, being mastered there, remixed in Holland and England, pressed in France and now back in his hometown, just on a different physical mean. A passEnger track has been included in The Bad Mask EP, published by Tabernacle Records. The label is managed by the Glaswegian guys who throw the “Slabs of the Tabernancle” parties, and the 12″ includes production from various artists that have played at the party. Other tracks included are by abstract techno maestro Arne Weinberg, Ai and A.R.T. publishing artist The Third Man, and John Heckle, who already released on Sula Muse and Mathematics. Placid Haze, the track included in the record, is a special one for me, glad it finally found a home in such good company. Some time ago I co-curated the compilation In Acque Libere, born to support the campaign for the publicity of water in Italy. It contains music from Turin-based artists only, and it’s available for free download at the Torino Sistema Solare web page. This is the track I provided for the compilation.